My Twitter account had been dormant for a couple of years, but was resurrected due to a plan at work to have our own organisation's Twitter account. So I started following various people and entities (it's amazing how it has evolved! ), and tweeted too, to test the waters so to speak. But I did not use my mobile phone to tweet as SMS here in New Zealand is quite costly. It's $0.20 per text for Vodafone. That's roughly P6.00 in Philippine pesos, where it's only a peso to send a text message there! Sure, there are promos to send more SMS for lesser amount of money but my texting habits here is just not the same in the Philippines. I will surely be unable to consume 200 SMS messages in a month. Plus, the promo expires in a month! Down the drain your unspent SMS goes. Telecom provider 2 Degrees is loads cheaper but they do not support Twitter as of this writing. Which makes me wonder, because they just might be able to make the Twitter service more usable by providing it in their network, and make a profit from it. But I digress. I downloaded Silver Bird (originally Chromed Bird) for Google Chrome because I am already a user of the said browser and integrating a Twitter app in it will be the convenient way to go! I have been using this app for a couple of months now and it's just been great. Its usage is quite straightforward. Just click on the Silver Bird icon (which is actually coloured Blue, which turns Red when you have new tweets) located at the right end of the address bar of Chrome and out comes your Tweets mixed with the accounts you follow. 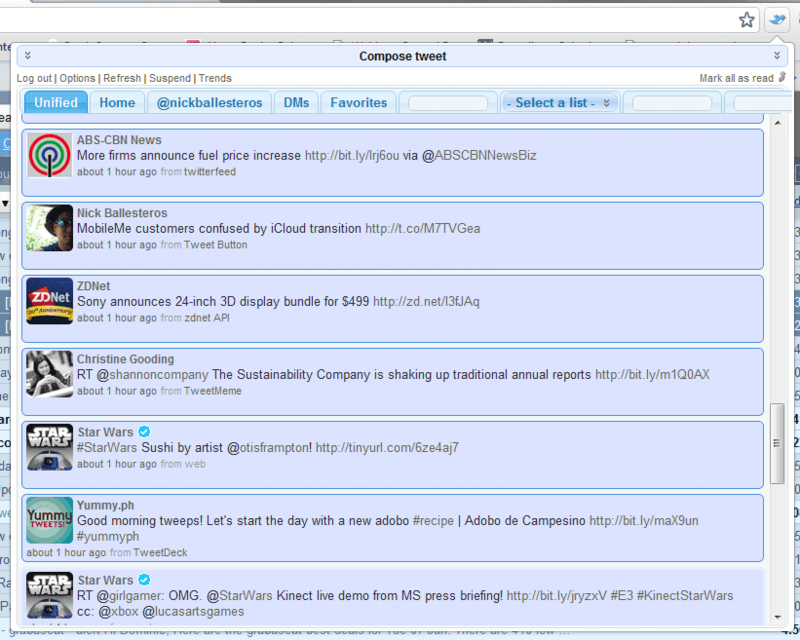 You can see your direct messages, as well as messages addressed to you in the other tabs. You can also name other tags for your favourite Tweeps. 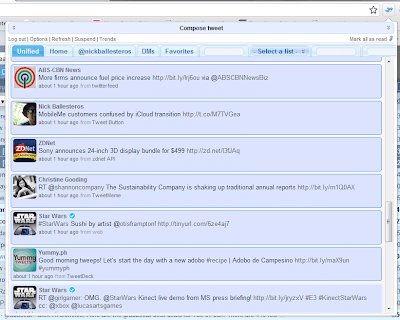 I have also installed TweetDeck for Chrome last week but I find the interface overkill for my purpose. If you want to consolidate your updates from your other social media accounts such as Facebook, then TweetDeck is the way to go. But Silver Bird suits me just fine. Besides, I shouldn't be spending too much time on Facebook anyways!